Eastern State Terror Behind the Walls is a haunted house in Philadelphia, Pennsylvania PA. Pennsylvania Haunted Houses are some of the best haunted houses in America and Hauntworld.com will help you find Pennsylvania haunted houses but haunted houses in Philadelphia, PA . Hauntworld.com rates and reviews the scariest Pennsylvania Haunted Houses including all Haunted Attractions around Pennsylvania including Pittsburgh, Lancaster, Philadelphia, and all Halloween and Haunted Houses in Pennsylvania. Now read all the history, details and go behind the scenes of one of Americas SCARIEST haunted houses located in Philadelphia, PA.
Just blocks from the tall skyscrapers in downtown Philadelphia lies one of the most important and influential buildings ever constructed in the United States – the Eastern State Penitentiary. 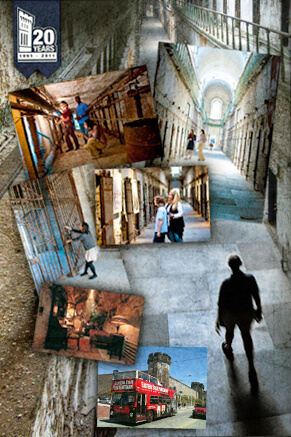 Today Eastern State Penitentiary Historic Site is a thriving tourist attraction open every day, twelve months a year. Hundreds of thousands of people visit the penitentiary each year to explore the abandoned cellblocks; take “The Voices of Eastern State” Audio Tour, narrated by actor Steve Buscemi; and to see the history exhibits and critically acclaimed artist installations. Terror Behind the Walls, one of the nation’s largest and most ambitious haunted houses, takes over the cellblocks each fall. Over the past 20 years it has grown to become one of the nation’s most recognized Halloween attractions. It has been called “perfect for Halloween” by The New York Times and ranked the “Number 1 Haunted House in America” by AOL City Guide. As the penitentiary prepares to celebrate the 20th season of Terror Behind the Walls, HauntWorld looks back at how this once revolutionary penitentiary eventually fell into obscurity with a very uncertain future, only to be ultimately resurrected as a world-class tourist attraction and home to one of the nation’s most successful Halloween events. But Eastern State wasn’t only famous for its radical new prison philosophy, which later became known as the “Pennsylvania System;” it was also world renowned for its architecture. “The penitentiary’s original seven cellblocks spread like the spokes of wheel and had running water and central heat even before the White House,” says Kelley. In fact, Eastern State is considered to be the first large-scale modern building in the United States. More than 300 prisons worldwide are modeled after Eastern State Penitentiary, making it one of the most influential buildings in history. By the early 20th century, though, the optimism that had once surrounded the penitentiary had all but vanished. Its once revolutionary system of solitary confinement had gradually broken down, and by 1913, Eastern State officially became a congregate prison. During the 20th century Eastern State operated mostly under the radar. It was no longer famous, no longer modern, no longer on the cutting edge. Finally, in 1971, the Commonwealth of Pennsylvania closed Eastern State Penitentiary after 142 years of operation. During this time, there were nearly 100 escape attempts; numerous riots; and more than 80,000 men and women who had called the penitentiary’s vaulted, skylight cells “home,” including the famous bank robber and escape artist “Slick Willie” Sutton and notorious gangster “Scarface” Al Capone. “When Eastern State was closed, there was no clear plan for its future,” explains Sara Jane Elk, Eastern State’s President and CEO. “For twenty years, the massive penitentiary complex sat all but totally abandoned.” Vandals smashed skylights and windows. Roofs began to fail. Mother Nature began to consume the building; a dense urban forest grew not only outside, but also inside the buildings. The future was uncertain. In 1980, the City of Philadelphia purchased the penitentiary with the intent of redeveloping the site. “Proposed plans included condominiums, a shopping center and even an amusement park,” says Elk. However, a group of architects, preservationists and historians realized that this National Historic Landmark must be saved. “They formed a group called the Eastern State Penitentiary Task Force,” according to Elk, who was an original member, “and urged the City to reject all proposals for commercial use of the property.” Finally, in 1988, the city agreed to save the penitentiary, and the first limited group tours of the building began. The first Halloween fundraiser at Eastern State took place in 1991. That first year, the event was held on Halloween night only, and tickets were only available as part of a dinner package through neighborhood restaurants. The event consisted of actors telling ghost stories in the abandoned prison. Just a few hundred people attended that first year, but it was clear that the event had had a significant impact. “Many people don’t realize that our Halloween fundraiser actually predates our daytime tour program,” says Bertolino. Eastern State Penitentiary didn’t open for historic tours on a daily basis until 1994. Even then, visitors were required to wear hard hats and sign liability waivers, but more than 10,000 visitors attended that first year. 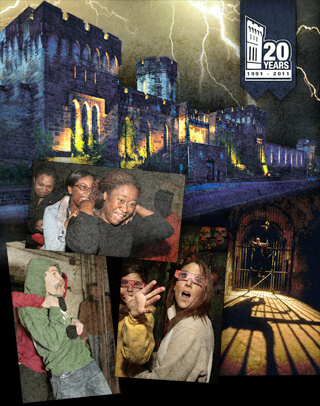 In 1997, Eastern State’s Halloween event was rebranded as Terror Behind the Walls to distinguish it from the growing daytime prison tour program. That same year, the event was transformed into a high startle, low gore walkthrough haunted attraction. “The massive Eastern State Penitentiary may be the best location in the United States for a haunted house. With massive walls, lined with towers and arrow-slit windows, this prison was built to intimidate,” says Jason Ohlsen, Eastern State’s Associate Director for Design Services. Hosting a haunted attraction in an abandoned penitentiary also has its disadvantages at times. “Up until 2001, every visitor to our haunted attraction had to wear a hard hat,” says Ohlsen. Aside from the obvious disadvantage of hard hats falling to the ground each time a visitor got scared, they also limited growth of the event. Eventually, stabilization efforts eliminated the need for hard hats, giving Ohlsen and his creative team the ability to push the boundaries of their attraction designs. The 2011 season will be the 20th anniversary of Terror Behind the Walls and, according to Brett Bertolino, it will be the pinnacle season since the event’s inception. “We’re bringing back our most popular attractions, with a few new surprises, of course, and introducing two new attractions, which are our most ambitious to date.” The 2011 season of Terror Behind the Walls will include seven attractions in all. Once guests enter the penitentiary complex, they gather in a nearly 200-year-old exercise yard outside of Cellblock 7. Here they are entertained by clips from the various paranormal television programs like “Ghost Hunters” and “Ghost Adventures” while they wait for their turn to enter Terror Behind the Walls. However, the event’s website warns guests...not "let their guard down..."
Next guests enter the first of Terror Behind the Walls’ six interior haunted attractions – The Gauntlet. This attraction ushers visitors into the facility through a maze specifically designed to distract and disorient them from being able to find their way back out. Guards rule this area and move effortlessly above the visitors via an intricate catwalk system that allows them to drop into any scene at any time. The zone concludes when guests board an abandoned Department of Corrections bus, which was used as a prop in the Hollywood film Transformers 2. This exterior steel maze is brand new for 2011 and is full of surprises to prevent escape! 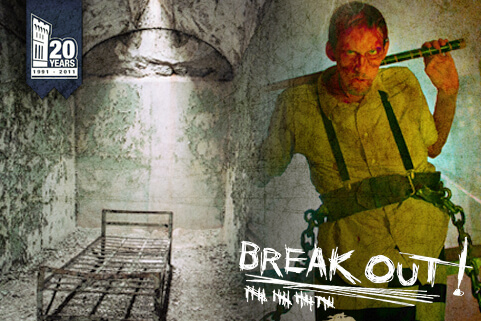 The second attraction, Lock Down is housed in the historic Cellblock 12, a three-story wing constructed in 1911 and believed to be one of the most haunted locations inside of the prison complex. Here, the script has flipped and the inmates have taken control, the guards rendered powerless. Lock Down features custom special effects that create the illusion that the walls of metal bars and cell doors are actually electrified. Next, guests enter Infirmary, which, until this year, was the largest and most sophisticated attraction Ohlsen and his crew had created. Infirmary is a hospital-themed haunted attraction that invites guests to explore the prison’s long-abandoned medical wing. Startling surprises await visitors as they enter the empty operating rooms, recovery wards, and, of course, the morgue. A giant walkthrough sterilization chamber is guaranteed to induce vertigo even in guests with the strongest stomachs and minds. Next, guests enter The Experiment: in 3D!, which is admittedly, according to Ohlsen, the event’s only attraction that is light on the prison theme. “We introduced our first 3D haunted house in 2000 and have, over the years, seriously thought about not including 3D as part of the event. It doesn’t really fit our theme, but we’ve decided to keep one 3D haunted house in the rotation each season because that is what our guests tell us they want.” According to Ohlsen, The Experiment: in 3D! is consistently ranked by guests as one of their favorite attractions. After The Experiment, visitors trade in their 3D glasses for a small, handheld flashlight and enter Night Watch. “In 2006 we introduced the concept of having visitors light their own path as they explore the final attraction,” says Bertolino. The idea of exploring an abandoned prison with just a flashlight captured the imaginations of guests, making Night Watch an immediate crowd pleaser. For guests wanting the ultimate Halloween experience, the penitentiary offers the “Eastern State After Dark VIP Tour.” The evening begins with an hour-long, guided flashlight walking tour of the abandoned penitentiary. Highlights of the tour include the cellblocks, Death Row, Al Capone’s cell, and the underground punishment cells beneath Cellblock 14. Following the tour, guests are escorted to the front of the line for Terror Behind the Walls. 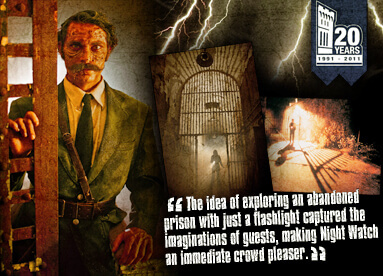 Each guest also receives a souvenir photo taken inside the penitentiary and a special Terror Behind the Walls LED flashlight. “During the past 20 years, Eastern State’s Halloween fundraiser has radically changed,” explains Sara Jane Elk. What began as a simple, low tech, single night ghost tour has grown to become one of the largest and most successful haunted attractions in the United States employing a cast and crew of more than 250 people each show night.